GUANGZHOU, China – Oct. 11, 2018 – NetEase, Inc. (NASDAQ: NTES) has today announced that simulation and strategy game, Legend: Rising Empire, will officially launch in Europe, North America and Oceania on October 24, 2018. The medieval-themed mobile game features a combination of strategy and city-building gameplay where players act as feudal lords with ambitions to conquer the fictional continent of Favilla. Through keen military and resource management, players must gather resources and even pillage other players in order to gradually develop an empire from nothing but a small village. Build a Mighty Empire – Expand the reach of your fledgling empire by constructing new buildings and capabilities in your town. With over 40 buildings types available, there are plenty of options for your ambitious expansion. However, be sure to use your resources wisely and ensure your growing settlement isn’t left unguarded to pillaging from other players. Balance investment in economy and military in order to herald in a golden age for your civilization. Conquer the Strongest Enemy – It takes more than building to create an empire, it also takes military prowess and dominance. Take control of over eight types of military units in a strategic conflict with neighboring players where one tactical error could change your empire’s fate permanently. Whether you’re protecting your archers and catapults from enemy knights or deploying thieves to infiltrate the enemy, you must effectively manage the troops in order to maximize their effectiveness in combat. Forge Global Alliances – You don’t have to face the world alone thanks to the clever alliance system which allows players across the world to compete and work together in the same server. This means you can forge alliances with players all over the world in this persistent global battleground. Allies can not only battle alongside you, but also be an indispensable trade partner that shares crucial resources vital to developing and strengthening a young empire. 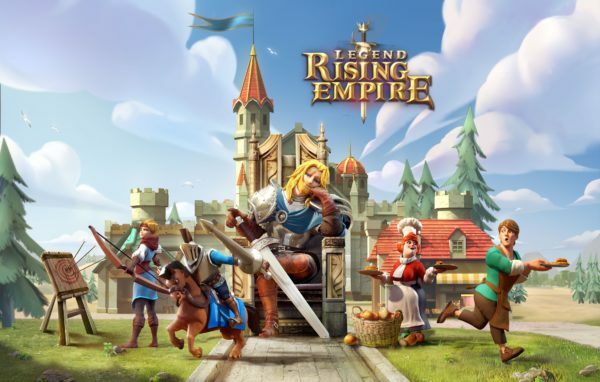 Whether you are a militant lord looking to dominate the battlefield or a benevolent leader hoping to use alliances with others to achieve a peaceful growth, Legend: Rising Empire offers a satisfying strategic experience on mobile for every sort of feudal lord. For more information please visit the Official Site: www.Legend-RisingEmpire.com or follow us on social media at: https://www.facebook.com/LegendRisingEmpire/. Assets for the game can be found here. NetEase, Inc. (NASDAQ: NTES) is a leading internet technology company in China. Dedicated to providing online services centered around content, community, communication and commerce,NetEase develops and operates some of China’s most popular PC-client and mobile games, advertising services, e-mail services and e-commerce platforms. In partnership with Blizzard Entertainment, Mojang AB (a Microsoft subsidiary) and other global game developers, NetEase also operates some of the most popular international online games in China. For more information, please visit: http://ir.netease.com/. For more information about NetEase Games, please visit www.netease-na.com .